“As it often happens when new software is introduced, our employees were a bit reluctant at the beginning. This soon changed, however, when they realized, how much time InLoox is saving us. We used to invest a lot of time an energy so ensure, all our projects were aligned. This is a lot easier now." AGCO/Fendt, the manufacturer of tractors and agricultural machinery, has introduced the InLoox project management software as part of its Future Project endeavor. Gone are the days when farmers were shaken to the core while riding their tractors. Nowadays, tractors and other agricultural machinery are highly efficient with more high-tech under their hood than your average car. Fendt is one of the leading manufacturers of agricultural machinery. Farmers around the world trust Fendt, which is at the forefront of technological innovation within the AGCO Corporation. The multinational with its headquarters in Duluth, Georgia, USA, is a global leader in the design, manufacture and distribution of agricultural solutions with net sales of $7,4 billion in 2016. 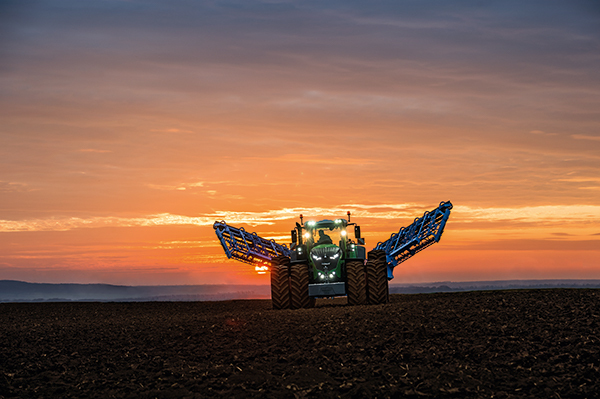 Fendt emphasizes innovation and quality, not only in its products. In 2014, Fendt started its Future Project with the goal of making its internal resource management more efficient and creating more value. The status-quo in processes, structures and systems was thoroughly examined and analyzed for potential optimization. During this screening process, Fendt realized the need for a professional project management software to be able to achieve its ambitious goals. “We identified the highly complex dependencies between projects as a factor that made the coordination of dates very time consuming,” explains Florian Hanrieder, former Head of MCC Marketing Communication, now Head of Digitalization, Fendt Strategy Office. The software, that Fendt was using was no longer adequate for the increasingly more complex project processes. Also, the different divisions had differing requirements: while one division had several full-time project managers for project planning and monitoring, other divisions handled their project management on the fly. One task, therefore, was to find a project management software that would support teams in their daily tasks without creating additional workload. Most of the employees work on several projects at once, which was an additional obstacle in coordinating resources. During the vetting process of the status-quo, Fendt realized that the ideal solution should integrate into Microsoft Outlook, as all its employees use Outlook daily and are used to the program. Fendt considered tweaking other Microsoft Office software add-ins to meet its project management needs and even toyed with the thought of developing its own Outlook-integrated solution. In the end the search for a fitting solution lead Fendt to InLoox for Outlook, the project management software that seamlessly integrates in Microsoft Outlook. The software manufacturer with headquarters in Munich, Germany, and offices in San Francisco, USA and Switzerland is a specialist in Outlook-integrated project management solutions. Its products enhance and refine Outlook, making it the platform for professional project planning and monitoring with document management, time and budget tracking features for projects of any size. Those responsible at AGCO/Fendt immediately liked the ability to synchronize project tasks and dates with their personal to-dos in Outlook. InLoox can be used for projects of any complexity. Project managers who need advanced Gantt-planning features work as easily with InLoox as employees who only need simple organizational features. The useful features range from task management with to-do-lists to large-scale project planning with monitoring and reporting functionalities. “The Outlook integration made getting started really easy. Much easier as if we had started with a completely new software with an unfamiliar UI,” says Florian Hanrieder. InLoox met all the criteria to make the project management at AGCO/Fendt more efficient. However, the company’s specific project structure necessitates some customization of the InLoox software. The company’s projects are subject to complex horizontal dependencies, especially concerning deadlines. However, the project portfolio also has a clear hierarchical structure. Top of this structure is the international roadmap with important milestones for the whole marketing division. This is followed by various projects. Before InLoox was introduced, aligning these projects with the higher-ranked milestones was tedious and often faulty. “A central aspect of our projects is coordinating the milestones and deadlines –dependencies between all the projects make staying on top of things a real challenge,” says Florian Hanrieder. InLoox developed a feature for Fendt, which simplifies aligning their projects. Single activities or milestones from one project plan can now be published in other projects. If, e.g., one milestone in the international roadmap gets pushed back by some days, each project manager of the subjected projects is notified automatically. This feature is available for all other InLoox customers who use InLoox version 9. Another customized feature that was developed in cooperation with AGCO/Fendt is the global calendar across all projects. InLoox users can display all their projects’ tasks, milestones, activities and summary activities in one calendar view. This is an easy for everyone who feels a Gantt-plan is too much for their needs, as it provides a simple yet concise overview of all the important project phases and deadlines. AGCO/Fendt has an InLoox PM enterprise license with an unlimited number of InLoox PM Universal User licenses. The license enables them to work on three separate logical databases. “As it often happens when new software is introduced, our employees were a bit reluctant at the beginning. This soon changed, however, when they realized, how much time InLoox is saving us. We used to invest a lot of time an energy so ensure, all our projects were aligned. This is a lot easier now,” says Florian Hanrieder. Apart from the publishing feature and the global calendar, the project teams benefit most from the planning feature of the Gantt-diagram and, of course, the synchronization of tasks and calendar dates with Microsoft Outlook. The notes feature is another appreciated feature as is the ability to attach documents to project plans. Since the introduction of InLoox, transparency in the project portfolio has markedly increased. “Division managers get a concise overview of all their projects in InLoox. They can monitor project progress and keep an eye on the milestones. This is aided by the global calendar,” summarizes Florian Hanrieder the benefits of InLoox for the company’s executives. Fendt is the leading high-tech brand within the AGCO Corporation, geared towards customers with the highest demands. Tractors and harvesting machines from Fendt are at work in farming enterprises and other interesting areas of application on fields around the world. In many areas of agricultural engineering, Fendt is the pioneer for trendsetting developments. Fendt customers therefore benefit earlier from the innovative technology for enhancing performance, efficiency and profitability in their farming businesses. AGCO Fendt employs some 4,200 people in the areas of research and development, sales and marketing, production, service and administration at its Marktoberdorf, AsbachBäumenheim , Hohenmölsen and Feucht sites in Germany. AGCO/Fendt - InLoox • Copyright 1999-2019 © InLoox, Inc. All rights reserved.